1 أوقية 2018 من العملات الفضية الخاصة بالرجل الحديدي Purchase your 1 oz 2018 Iron Man silver coin from our store today and enjoy the lowest price online. This 4th addition to the Perth Mint's celebrated Marvel bullion series features comic fan favorite, Iron Man, in all his hi-tech glory. The reverse design is none other than that armoured master of the quick comeback, who we all love so well, Iron Man, shown here, no doubt about to shoot a plasma beam from his upraised hand. The dynamic reverse design is unmarred by inscriptions, save for the Iron Man logo and small Marvel logo in the field. The obverse design is Ian Rank-Broadley's effigy of Elizabeth II, captured in astonishing detail, down to the very hairs of her head and the tiny jewels of her crown. Joining this striking portrait, the coin's denominational value, weight, purity, year of release and the names, 'Queen Elizabeth II and Tuvalu.' In spite of the charachter's name, Tony Stark's Iron Man suit is, in fact, not made of iron...rather it's constructed of lightweight Nitinol, a titanium and nickel alloy, which is far more suited to flying and other rigorous acts of heroism. 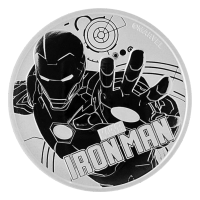 Own your piece of the magic that is the Marvel universe and diversify your holdings with a 1 oz 2018 Iron Man silver coin today.